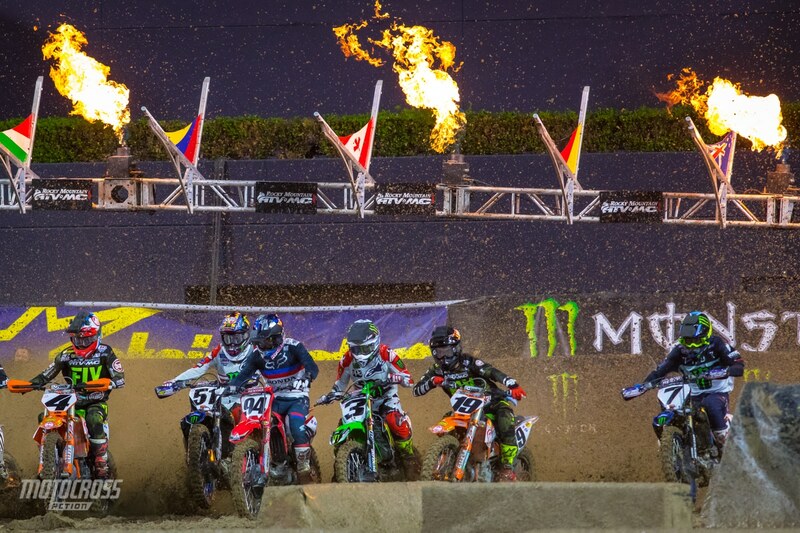 The 450 main event start in San Diego. 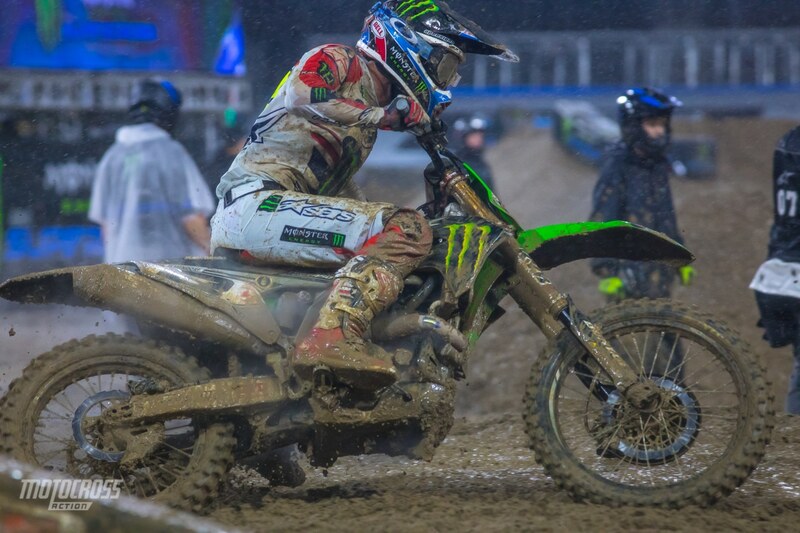 The fifth round of the 2019 Monster Energy Supercross season is in the books and it was Eli Tomac who claimed his first win of the year in the mud! Eli grabbed the race lead on the opening lap and led all the way until the finish, but that doesn’t mean the race wasn’t exciting. Justin Bogle put up a great fight and even with some crashes he ran second for most of the main event. 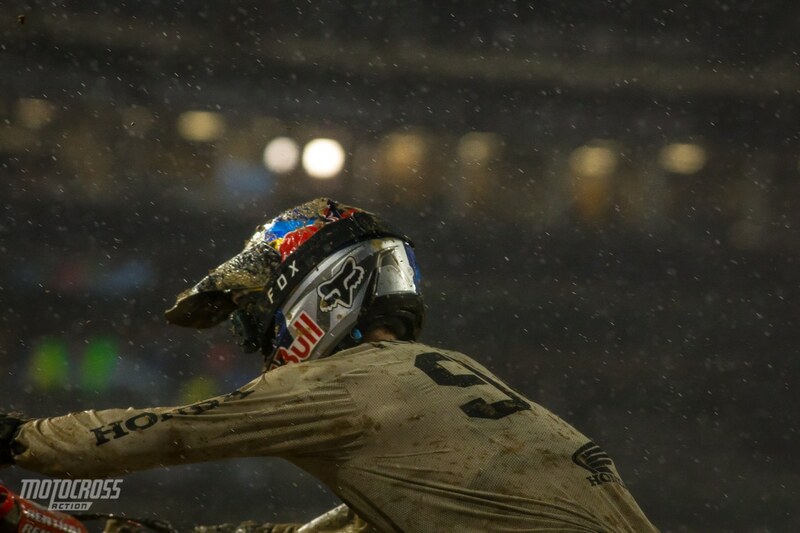 Ken Roczen got the holeshot, but he lost the lead when he crashed just after the second corner. Ken would pick it up quickly though and fight through the pack. 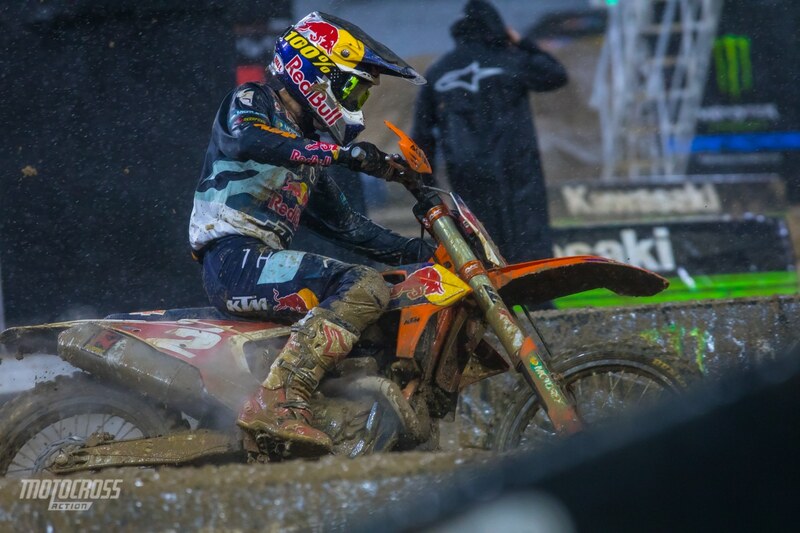 He caught all the way up to second and held it on the last lap before he made a small mistake and Marvin Musquin was able to pass him with one corner to go. 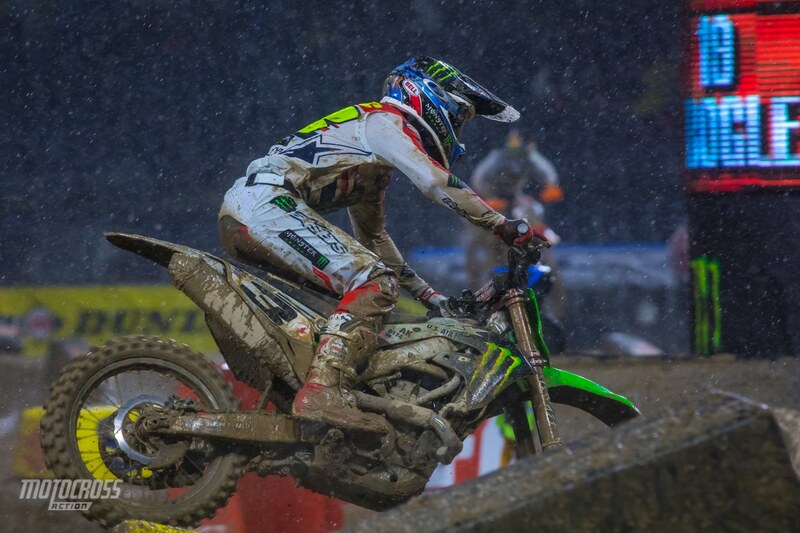 Eli Tomac wins in the mud! 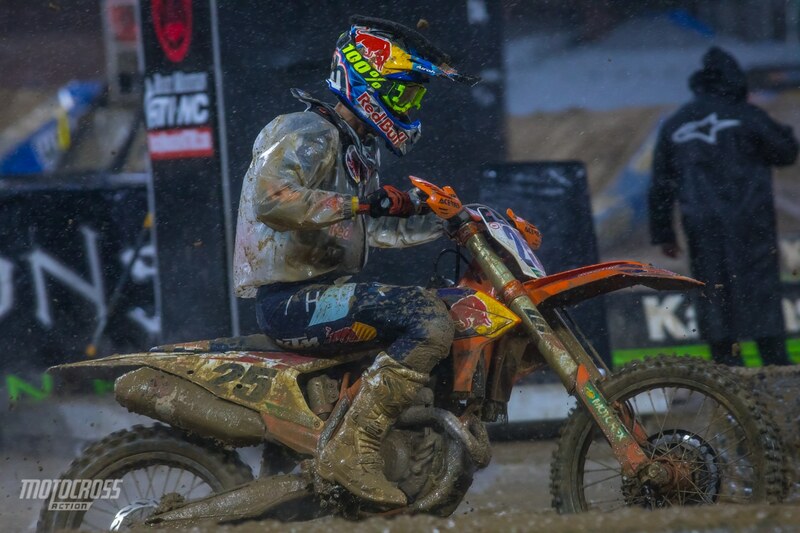 Marvin Musquin charged through the pack and passed for second on the last lap with one corner to go. Cooper Webb charged hard and finished eighth. Justin Bogle had a great main event going, he ran up in the number two spot for most of the race but after a crash and a few mistakes he would fall to fourth. After round five the points have shaken up quite a bit! Eli Tomac now has the points lead and Cooper Webb has dropped to fourth, eight points behind Eli. 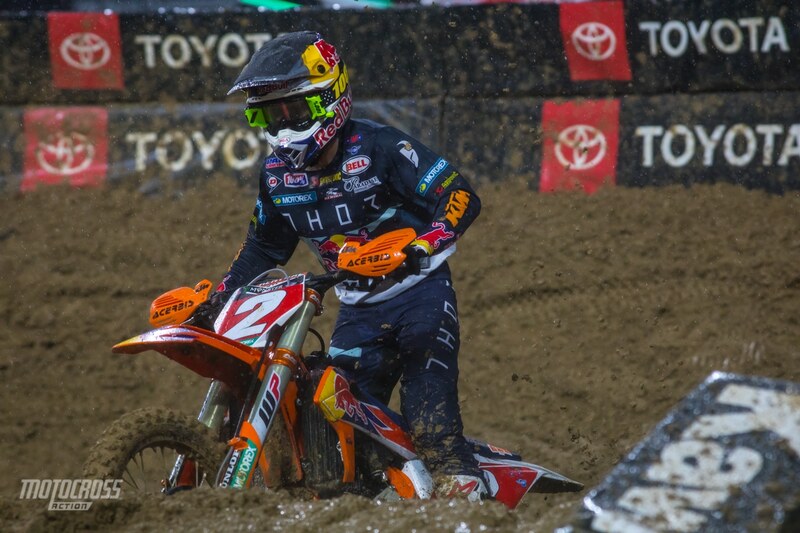 Marvin Musquin and Ken Roczen are now tied for second and they are both four points behind Tomac. 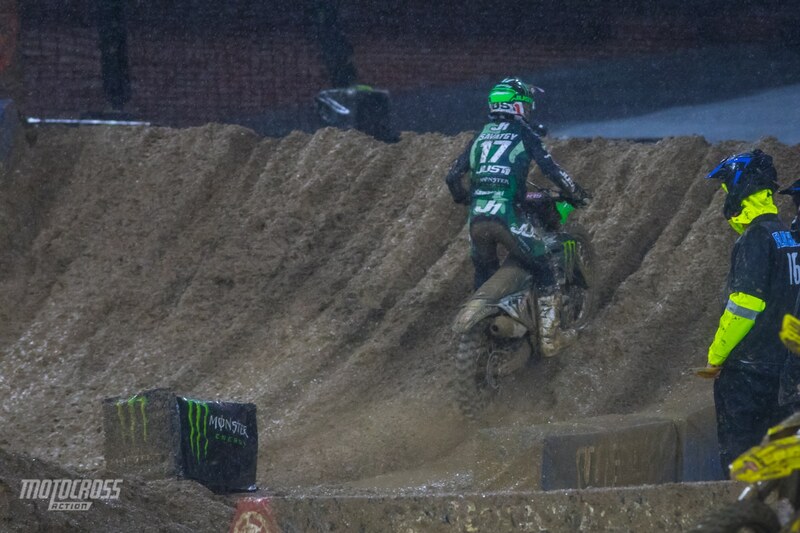 Eli Tomac takes over the points lead and he will have the red plate in Minneapolis. Marvin Musquin now sits second in the 450 point standings. 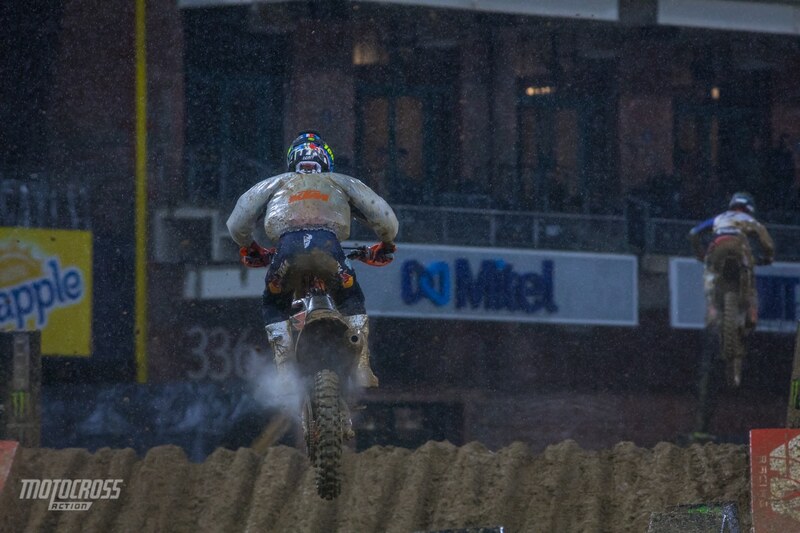 Ken Roczen is now tied with Marvin Musquin for second in points. Ben Lamay wins the 450 LCQ. 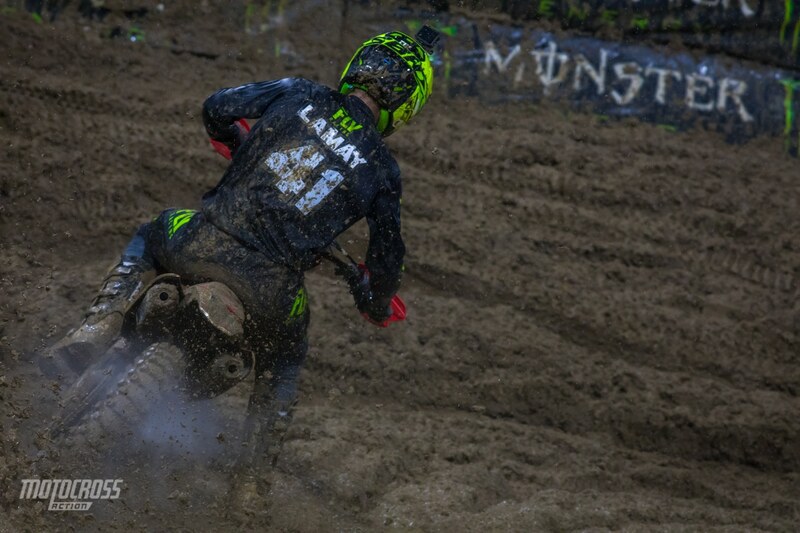 With a third place in the LCQ, Alex Ray qualified for the 450 main event. The ruts are getting deeper and deeper. Luckily we have a little bit of time in between the LCQs and the main events to groom a few sections. 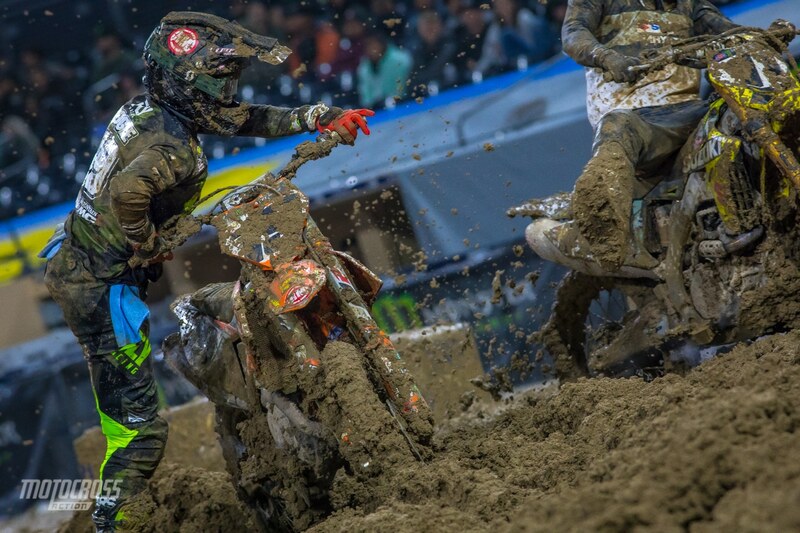 Eli Tomac proved that you don’t have to get the holeshot to win tonight in San Diego. He came through the pack, battled with Aaron Plessinger back and forth and finally on the last lap he made the pass stick and was able to take the win. Plessinger finished second with Musquin third and the H.E.P. 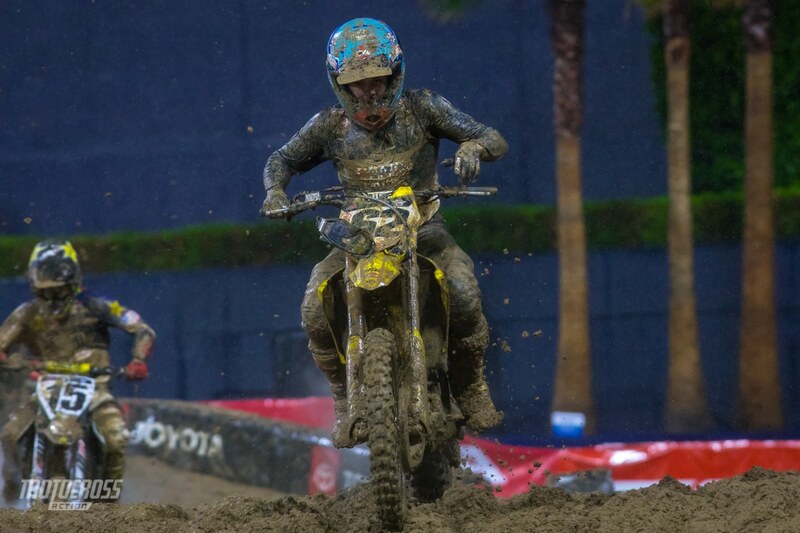 Suzuki rider Kyle Chisholm finished fourth. Eli Tomac wins 450 heat 2. Check out that solid rear brake rotor, designed specifically for mud races. 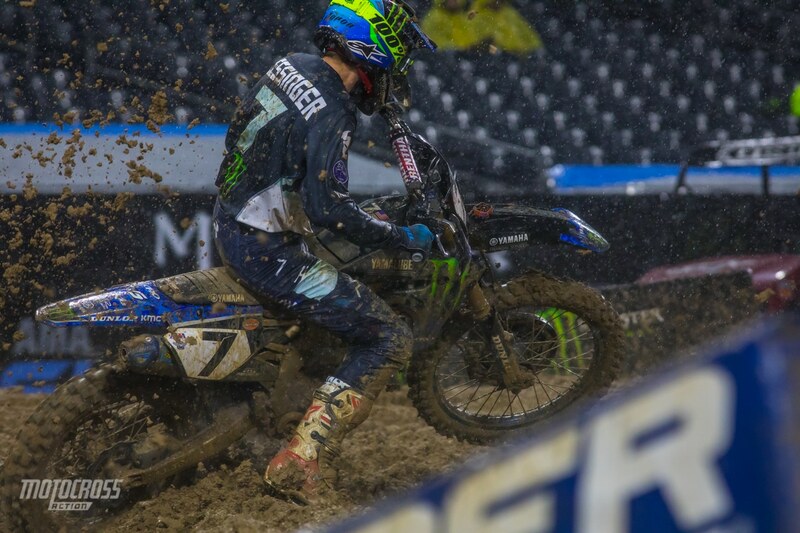 Aaron Plessinger is known for his mud riding, he battled with Tomac and finished second in the heat. 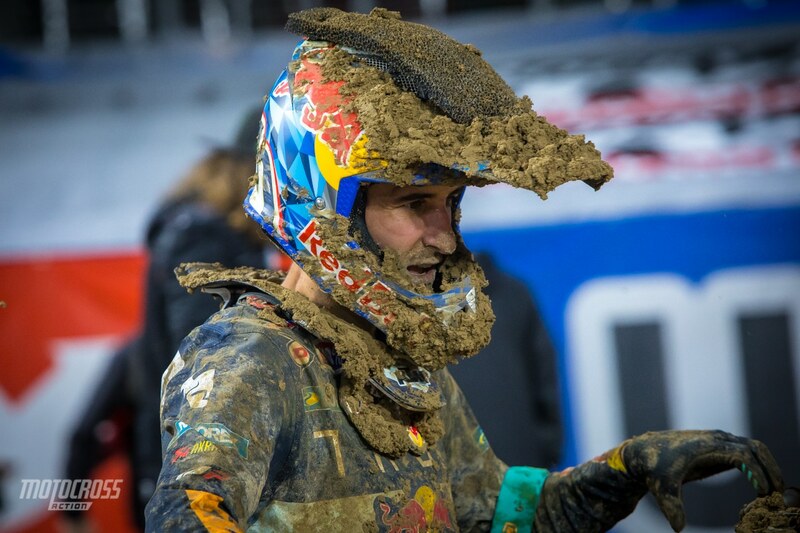 In the first 450 heat race, Ken Roczen grabbed the win and Cooper Webb the current points leader finished second. Joey Savagty rode a solid race, but after some mistakes Cooper was able to pass him. 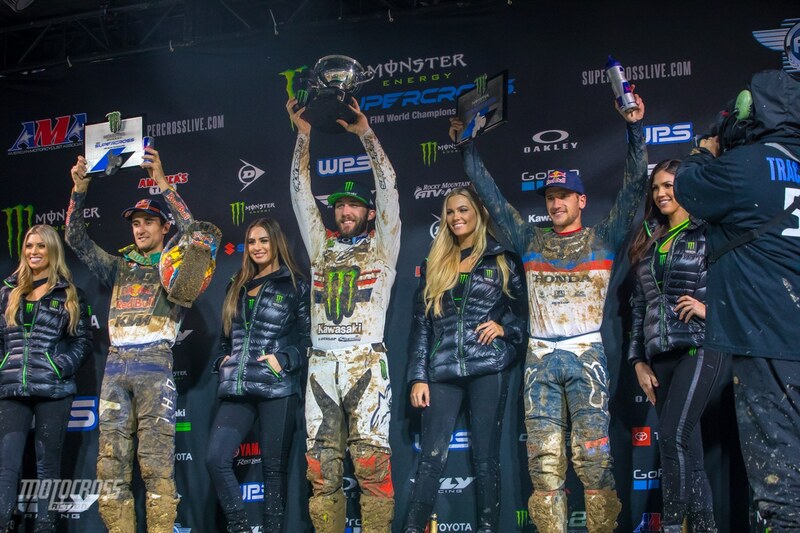 Joey finished third with Justin Barcia and Blake Baggett finishing fourth and fifth. Cooper Webb was riding great in the first heat race, he finished second. Joey Savagty finished third in the heat. 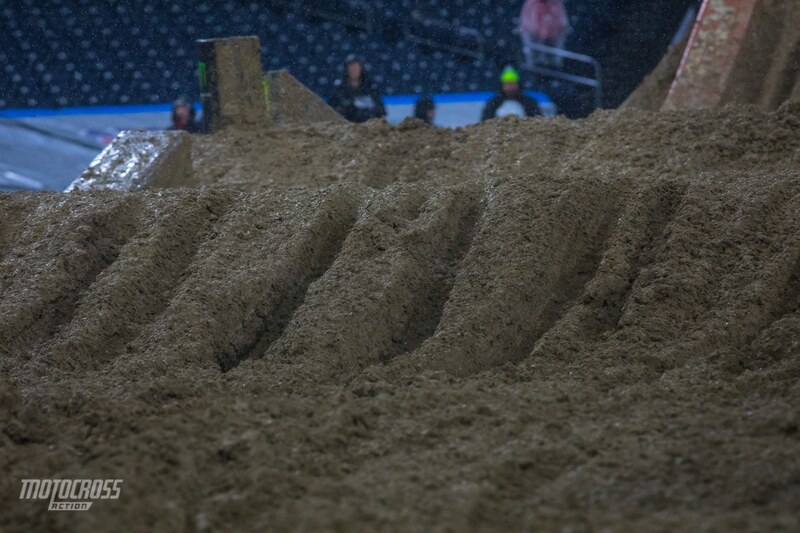 This photo shows us how gnarly these jumps are, and the riders are still clearing them! We know Justin Barcia likes the mud, he finished fourth in the first 450 heat race.